Ace I was an arcade-style shoot'em-up that was fun to play but somewhat limited in its long-term appeal. With Ace II, UXB has found a way to keep the game fresh for an extended period. 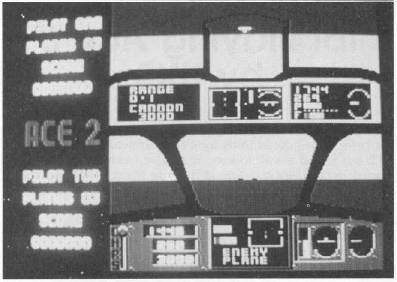 Ace II is one of the rare flight simulators that allows two players to fly against each other in a rather simple one-screen format. 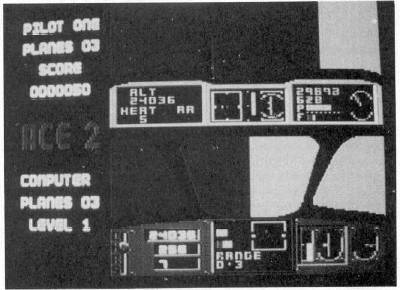 Each player is given half of the screen and a minimum of controls. The planes react quickly and the screen update speed is very fast. Even with only a few controls, you can improve your scores and performance if you know certain facts about Ace II. Although you are limited to a front view only, this is a great game for learning and performing aerobatics. With both players looking at the same screen, communication is easy. Try some follow-the-leader maneuvers where one plane follows the other visually. Head-on passing maneuvers can also be performed, but remember to keep your distance. This game allows for midair collisions. Computer pilots commonly try to lose the chasing plane by going into a hard dive. Unlike many other games, Ace II allows you to lose altitude very slowly. Don't be afraid to follow your opponent into a hard dive where you can't see the horizon. The programmers provided a pitch and roll display, so use it to keep track of where you are in relationship to the horizon. When you want to pull out of the dive, just level your wings and pull up. Changes in altitude can cause you to lose track of your opponent, so it's imperative that you keep an eye on both sets of gauges. The altitude of the enemy plane is displayed in the message area of your display but it only appears every few seconds. The best way to keep track of what's going on is to look at the other player's instruments. You must learn to use the throttle in your aircraft judiciously. If you go through the entire game at maximum speed with your afterburners lit, you will constantly over-shoot your opponent and be out-turned. High speed maneuvers also cause you to run out of fuel prematurely. When you're involved in a tight dogfight, reduce your throttle so your speed is in the 150- to 250-knot range. This will allow your aircraft to turn at its maximum rate. Remember, if you want to climb hard at this throttle setting, you'll need to increase power or face the possibility of a stall. If you run out of ammunition, don't give up. Unless your opponent is very low also, you are probably going to lose your plane. But if you have to go, why not take him with you? Use the game's midair collision capability as a weapon: Try to ram your opponent. This can be an especially good tactic if you have superior numbers of aircraft. Ninety percent of this game is fought at close quarters. You will have few opportunities to use your long-range radar-guided missiles, so load up with eight heat-seeking missiles and only take four radar-guided missiles. This will give you more missiles than the enemy has flares; you should get some hits. The first stage of an engagement is usually an exchange of radar-guided missiles. Your first instinct is normally to turn hard and avoid the missile. This is not a good idea. For a radar-guided missile to be effective, the target must stay in the sight area for the entire flight or the missile will lose its lock. If you start maneuvering hard while still a long distance away from your opponent, he will be able to keep you in his sights very easily. He will fire radar missiles at you one after the other. The best way to handle this situation is to get it over with as quickly as possible. Keep flying toward your opponent as fast as possible. You can use chaff and change altitude to avoid the missile. Once you get close, he will not be able to keep you in his sights and he'll lose lock-on. When this occurs, you have made the transition into a short-range dogfight engagement. Altitude is a very important component of air combat. Your computer opponent knows this and his first move will always be to fly straight up to 50,000 feet. If you don't follow him up to this altitude, he will have an advantage, so follow him. Level out as soon as you have achieved your altitude and start to look for your opponent. If you're still climbing with your nose pointing up when you come into radar range, he will fire the first shot because he can see you on his screen and you can't see him on yours. Approach the target at top speed and below 1000 feet until you're fired on for the first time. Once you are fired on, cut your speed to less than 500 knots. You can drop flares if you want, but they don't seem to have much effect. When the target indicator box appears on the screen around the target, the target is in range. Immediately drop one of your bombs. You must keep the target in the sight. If (or when) you are hit, regain control as quickly as possible to keep your target in the sight. When your first bomb hits, drop another immediately. As long as this second bomb hits the target before you take your third hit (I assume for purposes of this discussion that you use the three missile to kill setting), you will successfully complete the mission. The trick is to hit the target twice before it hits you three times. As mentioned earlier, you will lose altitude slowly. This will allow you to glide for a long distance when out of fuel, so don't panic. You have to reach the edge of the map. When your fuel level becomes critical, gain as much altitude as possible with your last few drops and glide the rest of the way. Note that if you are playing with the Crash Detection off, you can always make it back to the base. If you run out of fuel and cannot glide back to the base, just put it on the ground. You will continue on your present heading at whatever speed you were when you hit at altitude 0. It may take a while to get back to the base, but if you leave it alone long enough, you'll make it back. If you're playing against the computer in this mode it will take advantage of this, so you should learn to do it, too. In a turning contest like this, no one will win. To break the stalemate you must maneuver in the vertical plane. The two aircraft in this game are very similar in performance. If both players are at the same speed and bank angle trying to outturn one another, neither will have an advantage and it will be a stalemate. One way to mix things up and get an occasional chance at a shot is to maneuver vertically as well as horizontally. Try the loop, dive, split-S, and Immelmann turn. Maneuvering in this manner will allow you to put some space between you and your opponent and give you time to line him up for a shot.